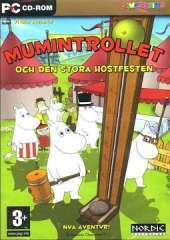 Another game from a series of family adventures, telling the adventures of the characters known from Tove Jansson's novel. Together with the Mummies, the young players prepare the annual autumn party. The summer is nearly over and Moomin is getting ready for the annual Autumn Party. But there are many things that must be done before the big night - and Moomin needs all the help he can get. Join the residents of Moominvalley as they prepare for the Autumn Party. Visit the wizard's tent and gaze into the magic crystal ball. Help Moominpappa test his speed, or visit the Snork in his workshop and see what he's up to. Collect all the pieces to Moomin's Autumn Party activity and get everything ready so that the party can start.